A simple question to all the cyclists out there: Do you use all the gears on your bike? Or are some gears rarely/never used? If that is the case, that means that your gear range is not optimised to your cycling ability or usage. Modern bicycles have many gears, from the 3x10 gearing of a MTB to a sleek 2x11 gearing of the latest road bike drivetrains. Even entry level bikes with 7 speeds are also able to cover a reasonably wide range of gear ratios. The reason for gears is to vary the gear ratio of the bike, so that the human legs can pedal comfortably at various speeds without spinning out or exerting overly high torque. The optimal gear range is when you can expect to use most of the gears (>80%) on a regular basis. Except for perhaps 1 top gear for downhill pedaling and 1 low gear for exceptionally steep slopes, you should be using all the other gears during your regular trips. Of course, the actual gear range will vary from bike to bike and rider to rider, depend on your pedaling style (spinner or masher), the terrain (flat or hilly), and fitness (casual or pro rider). Some people can get by perfectly with just 3-4 gears, or even single speed. For my bikes, I try to optimise the gear range for my usage, by using the appropriately sized chainring and cassette, so that >80% of the gears are used regularly. 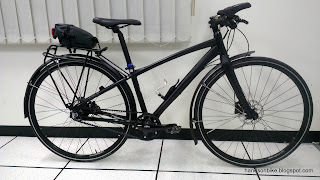 As an example, my Dahon Boardwalk has a rather narrow gear range (28" to 88") as shown below. 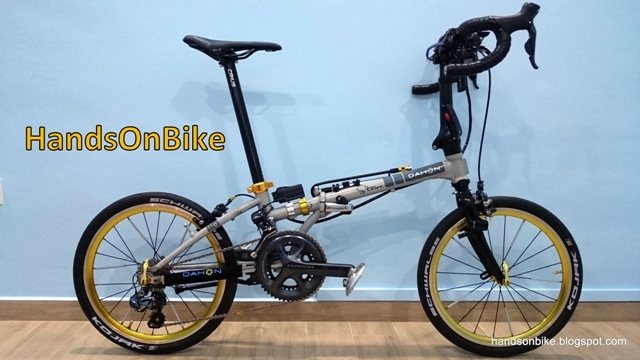 The top gear of 88 gear inches is considered low, compared to other 20" folding bikes with 53/11T (96") or even 56/11T (102") gear combinations. But this gear range is perfect for my riding style, as I prefer to spin rather than mash, and I don't cycle as fast either. On a normal commute, I will typically use gears 2-9, while in the large 53T chainring. The small 39T chainring is reserved for special hill climbing trips. Now, back to the main topic, which is the gear ratio on my Avanti Inc 3. As previously shown, the Avanti Inc 3 has a gear range that is comparable to that of a normal full sized road bike. Unfortunately, this means that the original gear range of the Avanti Inc 3 is too high for me. Let's focus on the gear range of the Avanti Inc 3. Using the stock gears of front 50T and rear 24T, together with the Alfine 11 internal hub, the gear range is as shown below. On a typical commute on the Avanti, I will typically only use gears 2 to 8. 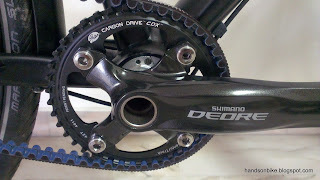 This is (not coincidentally) similar to the gearing that I use on my Dahon Boardwalk. Gears 9 to 11 are too high and never used. My target is to lower the overall gear ratios, so that the higher gears become usable, while I get even more low gears for slope climbing. 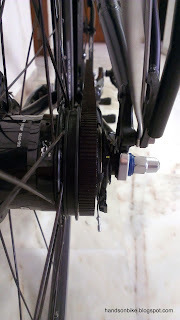 I have been researching on the various ways of reducing the gear ratios on the Avanti, but it is not as straightforward due to the belt drive system. On a normal chain drive system, all it takes to lower the gear ratio is to use a smaller chainring or larger rear sprocket, and modify the chain length accordingly. 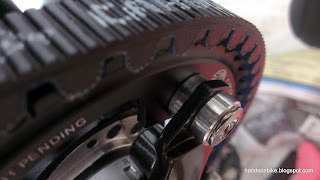 However, on a belt drive system, changing the chainring or sprocket size will mean a new belt is needed. This is because belts comes in fixed lengths, and the length cannot be altered. Due to the belt length restrictions, changing the sprocket or chainring size will also involve changing the belt, which is additional cost. Therefore it is best to change out as few parts as possible. Thanks to the Gates belt drive calculator, I can calculate the required belt length, rear sprocket size, front chainring size, or chainstay length required. With 3 out of 4 of these factors entered into the calculator, the value of the last factor can be calculated. 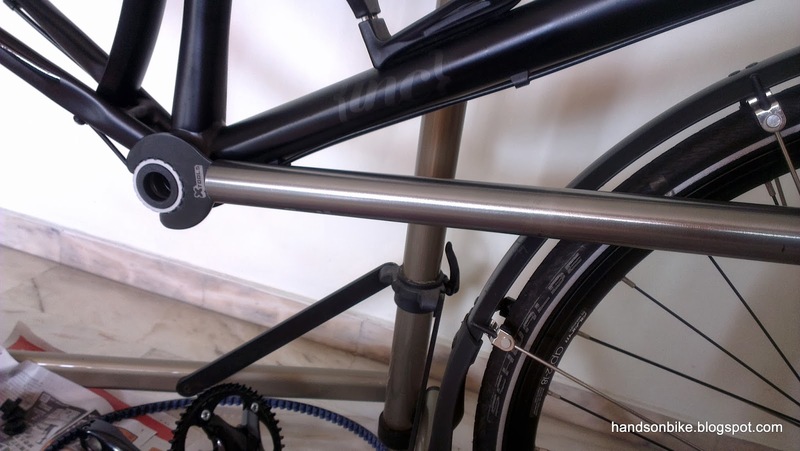 For example, using the original setup of front 50T, rear 24T and a nominal chainstay length of 444mm (as provided on the Avanti website), the required belt length is about 118T. Original belt drive setup on the Avanti Inc 3. Note that the calculated values are before belt tensioning, so there should be at least 2-5mm of adjustment length required for tensioning the belt. During the research, I found that the largest rear sprocket size available for the Nexus/Alfine 3 spline design is only 26T, which is hardly bigger than the stock 24T. This means that even if I change the sprocket from 24T to 26T, it will only result in a drop in gear ratio of about 8%, which hardly makes an impact as the approximate gear steps between the Alfine 11 gears is about 13-14%. This rules out Option 2 as the impact to the gear ratio is not big enough. Option 3 is to keep the same 118T belt, but to change to a larger rear sprocket and a smaller front chainring. This will lower the overall gear ratio. Using same 118T belt, but with larger rear sprocket of 26T and smaller front chainring of 46T. This will lower the overall gear ratio by about 15%, which is good as it shifts the overall gear ratios by at least 1 gear. Although this setup is theoretically possible, the required chainstay length of 449mm seems to be a little too long. 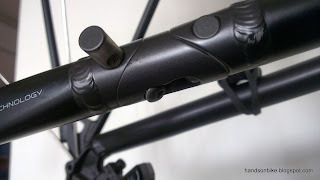 Even with the eccentric BB, I am afraid that there will not be enough adjustment range for proper belt tensioning (default chainstay length is about 444mm, so 449mm may be at the limit already). That leaves us with Option 1, which is to keep the same 24T rear sprocket, but to change to a smaller chainring. 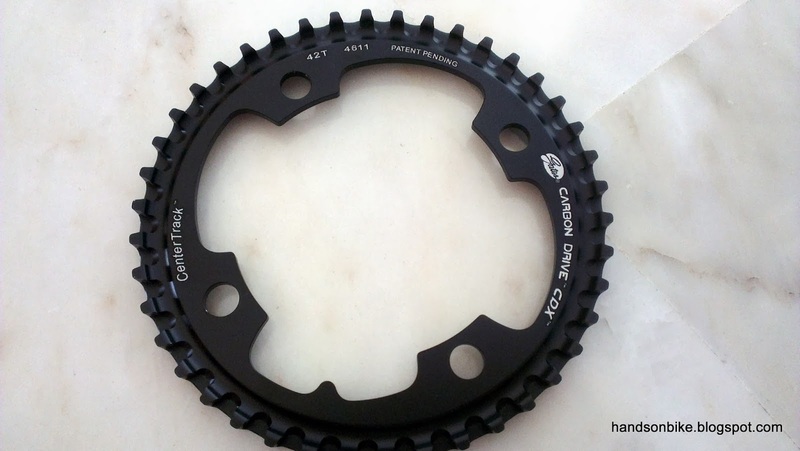 In order to lower the gear ratio sufficiently to make a difference, the chainring should be changed from 50T to 39T (22% lower) or 42T (16% lower). Using a 39T chainring will really drop the gear ratio by a lot, but what I was concerned about was the gear ratio of the internal hub. It seems that there is a recommended gear ratio for the Alfine 11, which is about 1.9 (Front chainring / Rear sprocket). The original setup of 50/24T gives a ratio of 2.08, which is a little higher. Using a smaller 39T chainring will give a ratio of 1.625 (39/24T), which I feel may be too low, and there is a possibility of damaging the internal hub. Just to be safe, I went with the safer option of a 42T front chainring size. 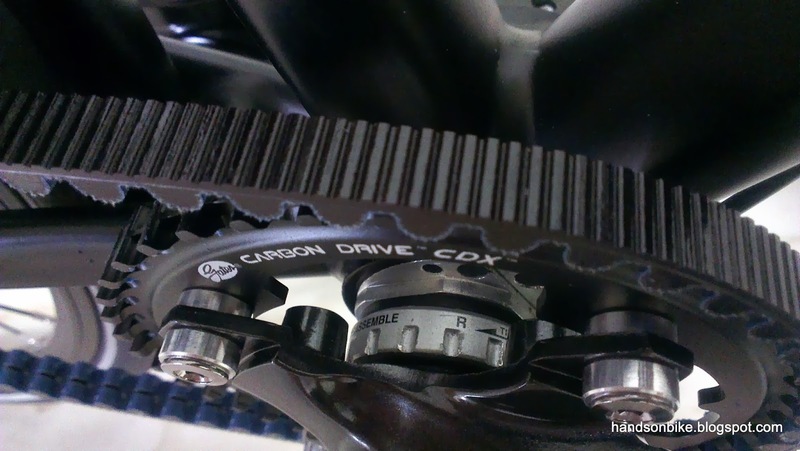 Although the gear ratio is not lowered as much, it is still a good decrease of 16%. The gear ratio of 1.75 (42/24T) is also closer to the recommended 1.9. Using the Gates belt drive calculator once again, we can check the belt length required for this setup. 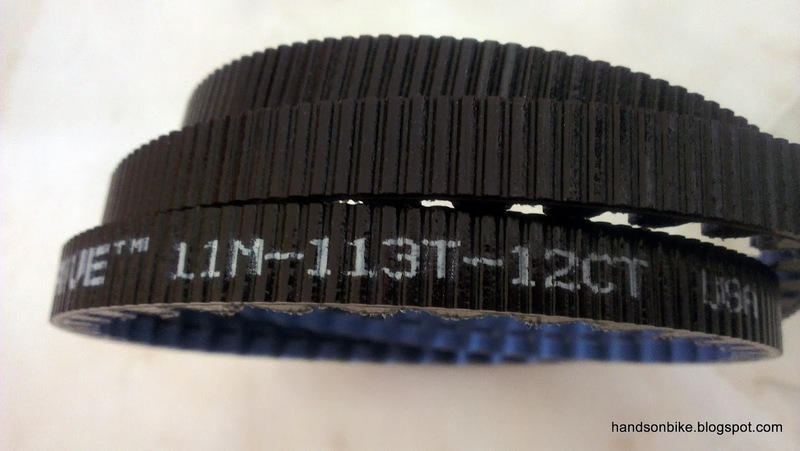 With a 42T front chainring and 24T rear sprocket, the new belt length required is either 113T or 115T. 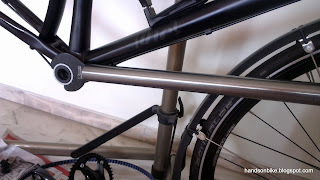 In this case, it is possible to use either a 113T or 115T belt, as both chainstay lengths required are either side of the nominal 444mm chainstay length. Due to the possibility of insufficient adjustment distance for belt tensioning, I decided to go with the 113T belt instead of the 115T belt. As you can see by now, changing the gear ratio on a belt drive bike with internal hub is not easy, as there are many more factors to take note of, such as the chainstay length, the available sprocket/chainring sizes, the available belt lengths, the belt tensioning, etc. But finally I decided to get the 42T chainring to try, together with a shorter 113T belt. Well this is just the start of the challenge, as the 42T Centertrack chainring is only available in the 4 arm, 104mm BCD type (MTB crank arm). This means that I will also need a new 4 arm MTB crankset to replace the previous Sora road triple, 5 arm 130mm BCD crankset. In order to change out the belt from the original 118T to the new 113T belt, the frame needs to be split, as the belt comes in a complete loop. This is when the frame joint on the right side seat stay comes into play. As shown below, the joint can be opened for installation/removal of the belt. 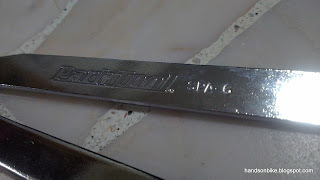 Now, for the new MTB crankset, the eccentric BB shell width is already at 73mm, which is a suitable width. 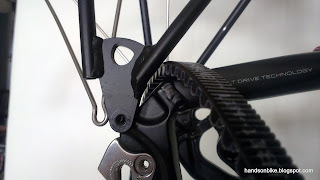 In fact, a 2.5mm spacer is required on the right side to get a proper chainline. 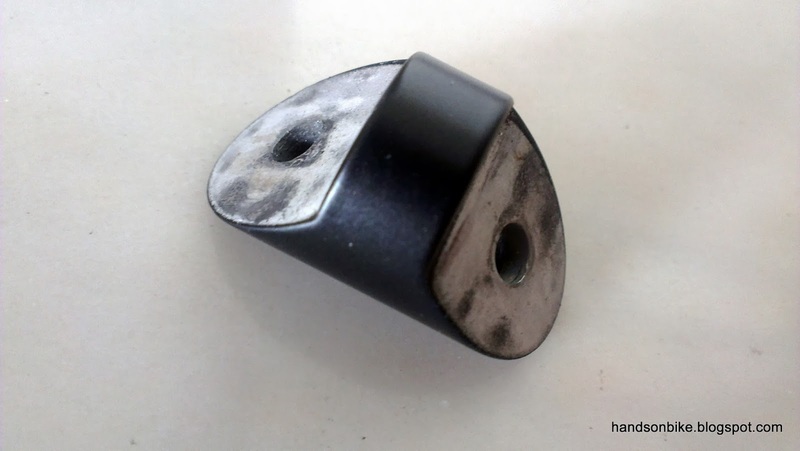 Without this spacer, the spindle will be too long on the left side. 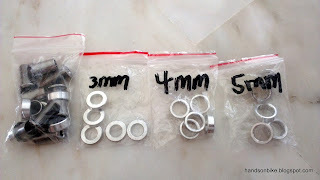 The BB is already a MTB Hollowtech II BB, so all I need to do is to remove the right side BB cup to install the 2.5mm spacer. However, I found that no matter how hard I pushed the BB tool, the BB cup just would not budge. Luckily, I had an idea to use a Dahon seatpost to get extra leverage on the tool. In fact, the large diameter Dahon seatpost fits onto the BB tool like a glove! With the extra leverage of the "cheater bar", the BB cup could be removed easily. Using the Dahon seatpost for extra leverage! 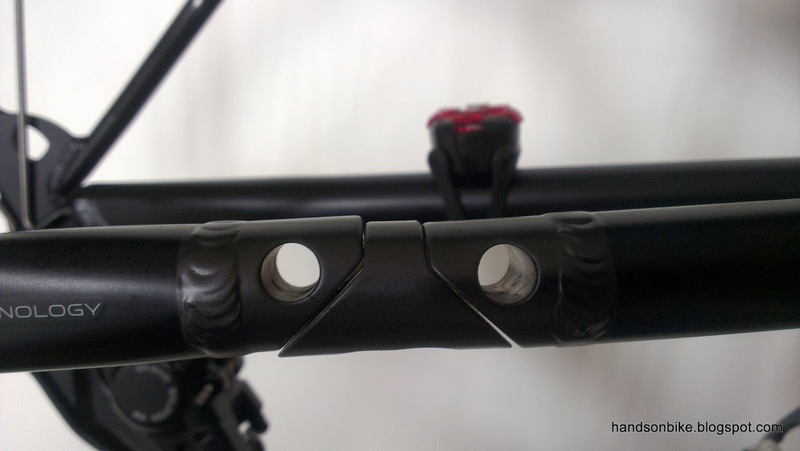 Very useful to loosen tight BB cups from the frame. MTB SM-BB51 BB with the 2.5mm spacer installed under the right side BB cup. The next step is to install the new crankset and chainring! 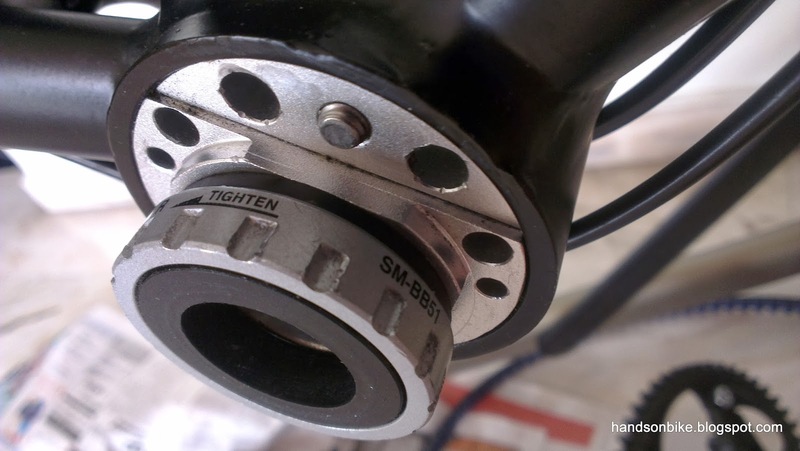 As the MTB crankset has an even wider chainline compared to the road triple crankset, chainring bolt spacers will be required to adjust the position of the front chainring. A straight chainline is very important for belt drive systems, to avoid premature wear and noise issues. 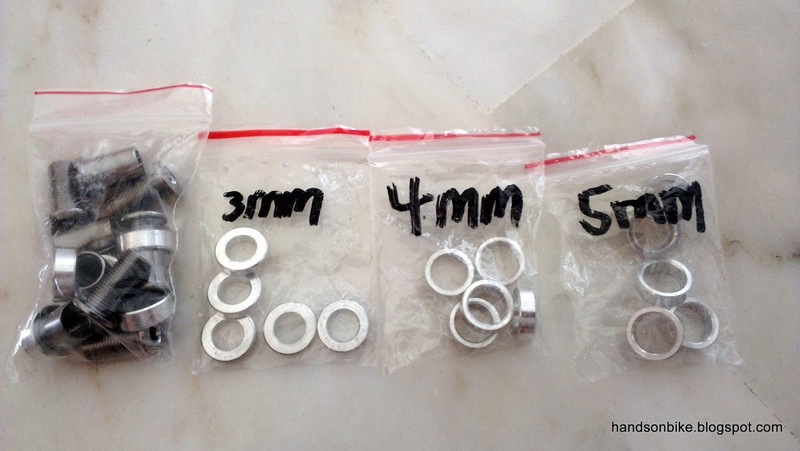 Long chainring bolts, plus spacers of various thickness for chainline adjustment. 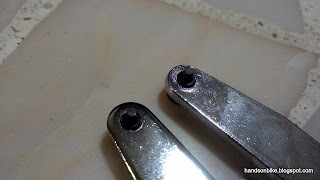 To cut the long story short, my calculations showed that in order to maintain the same chainline on a MTB crankset, I will need to use a 4mm spacer to shift the chainring inwards. Just to be safe, I also got spacers of different widths for chainline adjustment if required. Final setup, with a 4mm spacer in between crankarm and chainring to get the correct chainline. 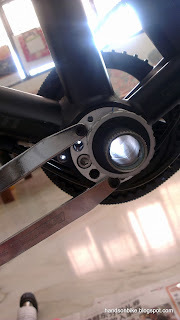 The other 5mm spacer is necessary due to the chainring bolt which is too long. Perfect chainline! I am glad that the calculations are correct. 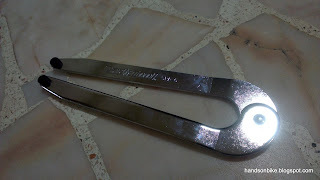 To make it easier to adjust the eccentric BB, I got this new Park Tool Pin Spanner for adjustment. This pin spanner is special as it is adjustable to fit holes of different sizes and distances. ...or opened to suit different hole dimensions and distances. 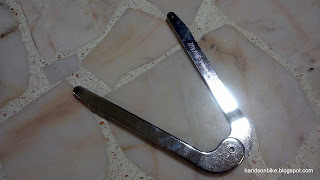 This is how I use the pin spanner for the eccentric BB. Hook the pins into any 2 holes on the eccentric BB and turn the spanner to adjust the belt tension. Finally, the upgrade is complete! The gear range has been shifted downwards, to a more appropriate and usable range for me. The gear that I usually cruise in has been shifted from gear 6 to gear 8. The lowered gear ratio of gear 1 will be very useful for steep slopes! New gear ratios with a 42T front chainring. Top gears are now more usable, and the lowered gear 1 will be useful on steep slopes. 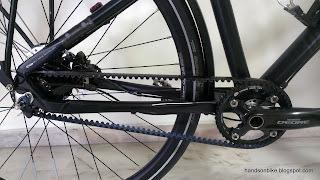 New belt drive system! The front chainring now looks much smaller compared to the previous 50T chainring. This upgrade has not been easy, as a lot of research was needed to learn more about the belt drive system and the limitations. Gathering the required components was also not so straightforward, especially for the chainring as it is not easily available online. However, all this effort is worth it as the gear ratio on the Avanti Inc 3 is now optimised, and I can use most of the gears on a regular basis. The other benefit is a lower bottom gear for tackling those steep slopes. Another unintended benefit is the slightly lighter weight drivetrain, due to the smaller chainring and shorter belt. Nice post and well explained. You have started me thinking about making a change. I've just finished installing the Bushnell Featherweight eccentric and Shimano 105 on mine. The Bushnell is a nicely made piece of kit and the way it tightens into the shell is very smooth with no attempting to pull to the side as you tighten. A worthwhile upgrade on its own but more so for the fact it lets me use the 105 and matching bottom bracket, which feel much smoother and more solid than the ISIS/FSA combo. The only other changes I've made so far are a Thompson Elite seatpost and stem, Salsa stainless steel front skewer and WTB saddle - all personal favourites from my MTB days. Good to hear that your upgrade worked nicely too! Its nice to use a road crank. I would use an Alfine crank to match the internal hub if it could fit my eccentric bb. I would love to see pictures of your upgrade! Any blog or pictures I could check out? In any case, if a smaller chainring is desired. A four arm crankset is needed. On hindsight, the 73mm eccentric bb proved to be good for me, as I could fit a four arm MTB crankset. I don't have a blog but will take some photos and get them to you somehow. Today I fitted some stick on cable guides to the downtube to lift the rear brake and gear cables. Mine have rubbed right through the paint on the forks. Bare metal is visible. 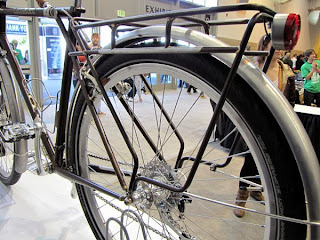 I can see in the close up photo from your "fenders" post that the cables on yours rest against the fork also. Have yours worn through the paint yet? 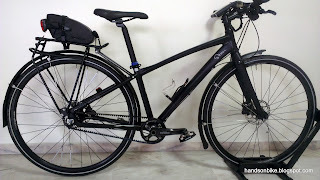 The cables supplied with the bike are too long. When it comes time to replace the gear cable I'll be shortening mine so that the cable rests against the head tube, not the fork. That way there's no rubbing when the fork turns. I put this in the category of basic bike setup that Avanti should be aware of. I'll also have to find a kit for the disk brake hoses. I've replaced these hoses before on my MTB, it's no fun bleeding the brakes. For now the cable guides will do the job to prevent any further damage. Thanks, was discussing with the mechanic at my local bike shop and he also recommended the patches and gave me a couple of pieces for free. Nice guy. He had an Inc in the workshop with the paint worn off in a similar position on the forks. Today I cut the shift cable housing down by 9cm and put in a fresh inner cable. This has lifted the cable to rest beside the head tube. Still get full turning with no issues and now no rubbing. I put a clear patch on just in case. Also picked up an olive and insert for the hydraulic brake line so I can cut it down as well. The mechanic showed me that because I'll only be undoing the hose at the lever end I probably won't have to do a full bleed of the system and can just bleed at the lever end. Will have a go at this on the weekend. Apparently the main thing to get right is a nice clean and straight cut through the line to make sure it has a good edge to seal against the new olive. By the way where did purchase your Gates sprocket and belt? I couldn't find the correct sprockets on sale on any website, so I contacted Gates directly through email. They then relayed the message to an Australian distributor, SC Imports, who emailed me. He then sent the parts over to me after I paid by Paypal. Good to see someone is bloging about the INC 3. I have one on order after like you looking at a couple of other Alfine plus Gates belt drive bikes, The one nearest to it and same price was the Scott sub speed 10 but found the following differences. 1 Only 8 speed hub 2 Disc brake lower Quality & 3 not as good looking as the inc 3. I see you have made quite some changes to the drive system on this bike. Must of cost a few dollers to do the changes? Fancy selling me the Afine bottom upgrade you first did then changed? Maybe we can ask Avanti to be able to build a bike to set specifications? I sure they would have done a lot of testing to get the bike were it is today but everybody is different in what they need.Avanti could make up inc 3s to suite different riding conditions as you have made quite significant changes to yours to suite your needs etc. Anyhow thanks for the interesting features you have written and please please keep up the good work! Thanks for commenting! Great to hear of other Avanti Inc 3 owners out there. The main reason I changed the crankset was to improve the stiffness, as the stock crankset was not as good as I would like. No issues with the brakes for now. The Shimano BL-M445 brakes are doing fine for now, not the most powerful but more than adequate for city riding. After changing the gear ratios on this bike, it now feels quite perfect. No other upgrade being lined up at the moment. Please in your next Inc 3 blog let us all know a replacement for the VERY expensive oil used in the hub. Must be someone out there who will be able to do a viscosity test etc and come up with a much cheaper alternative. Can't believe Shimano have designed a specific oil just for this hub? im trying to get a bicycle with stock nexus 8. is it possible to ugprade it to alfine 11 in future? 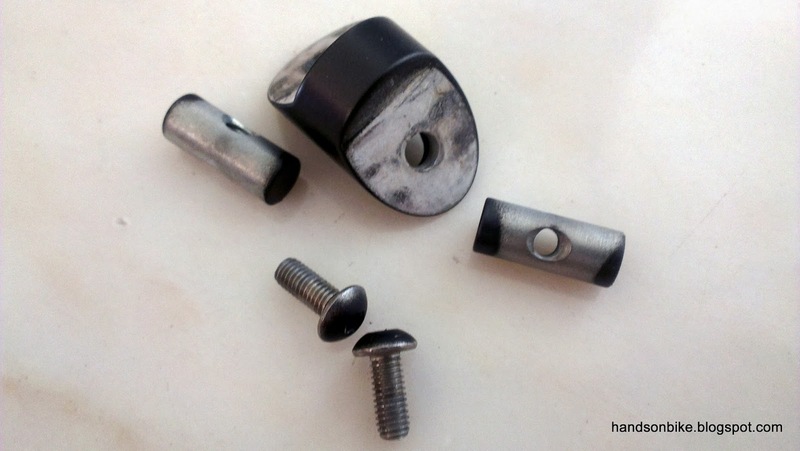 Upgrading would mean getting a new shifter, a new rear hub + rear wheel, new cassette joint. These are the upgrades you need to change from 8 speed to 11 speed internal hub. Also take note what is the brake system used. I would recommend getting one with disc brake setup, instead of rim brakes. Hi, I'm planning to do the same with my Alfine 11. Can you only use BMX cranksets? What about Shimano Deore? As long as you can match the chainring to the crankarm, it will work fine. You might need to adjust the chainline with chainring bolt spacers. I'm undertaking a similar change on my bike. Can you tell me where you sourced the chainring bolts and spacers? I recently bought a Avanti Inc3 and am considering changing the ratio as well. I'm leaning towards keeping the crank as is and swapping to the smallest available 46T. 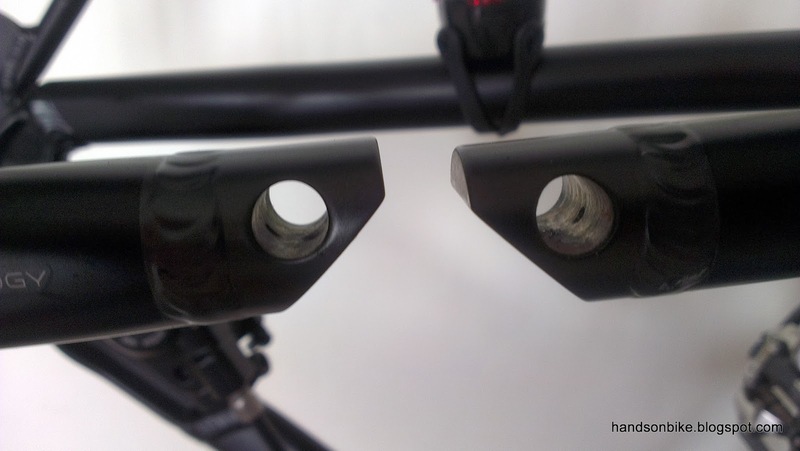 For the rear, I see that Gates makes a 28T for the Di2 of which has an unfavorable offset. I'm wondering though, if the spline is the same, it's likely an engineering company should be able to cut the centre out and reweld it with a zero offset like the standard ones are. Might be an simpler/cheaper method to achieve the same result, this would be a slightly taller ratio (1.643) to your originally proposed 39-24 (1.625), but I'm willing to test the limits on that. 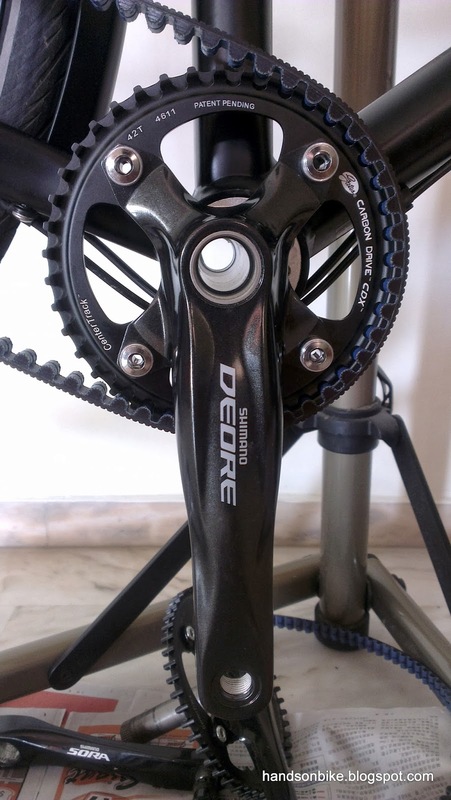 The reason for the offset on the Di2 sprocket is to have clearance with the Di2 motor unit. If you make it zero offset, it will interfere with the motor unit.